Now Love Potion #31 has been around since 1995. I've never actually had it, but the description does kind of remind me of the most excellent Queen of Hearts from Perry's. (side note: 2014 saw the debut of Love Potion #31 Dark but it did not return in 2015). And this is how you make it look scary. Since it's been around forever, there's probably not a whole lot I can add to the conversation, but I will say this if you haven't tried it, the swirl is quite potent. Thankfully it's not tangy nor does it have bite, but it is a potent gel of a swirl and I highly recommend you steady your hand when digging in to it. You don't need much of it to override the other flavors on your spoon. Overall I guess I just didn't really settle in to it. When I sampled it, it came across a bit sweeter (and more mellow), but when I had an entire scoop of it, well, it was more powerful than I was in the mood for. I wanted better balance with the white chocolate ice cream, which I really couldn't taste over everything else. The hearts are cute but not that impactful or plentiful. At the very least, jack up the chocolate chip content by 2x or 3x and then maybe will start having some fun here. As for the Rocky Road portion of my treat, all I will say is that I'm a little surprised they went with mini marshmallows instead of a swirl. 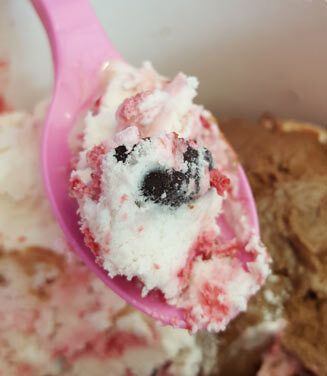 A swirl is more encompassing and enriching to every bite. Mini marshmallows are just kind of meh to me (though I realize many of you love them, I just don't find them to be the ultimate rocky road experience). Oh well. This is my all time favorite ice cream. It has white chocolate base ice cream, but honestly it overpowered by all the other flavors and might as well be vanilla. 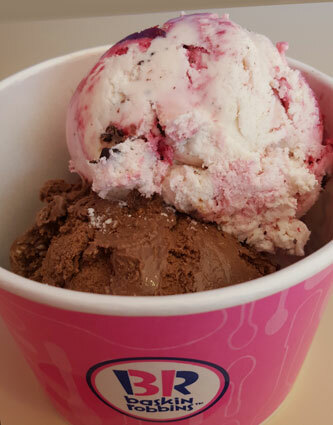 There is raspberry sherbet and a raspberry puree (the strongest tangy flavor) mixed with it along with chunks of chocolate. Then to top it off there are puffed chocolate hearts filled with raspberry syrup. Every year I have to remember to get in early and buy a tub before it sells out. 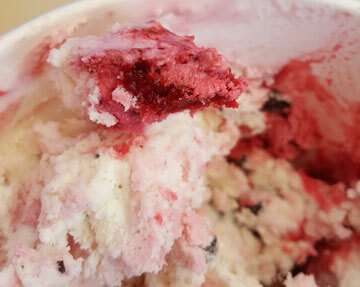 This ice cream is a well kept secret by those of us who have discovered it's deliciousness. This ice cream is only sold in February and those of us that love it buy up our own supply before it is sold out. Which happens very quickly unless your store knows and orders accordingly. I am lucky to live near one of those shops. So, an update report shall be forthcoming as to her impressions very soon. @FreezerCats: your store still had this one in stock? surprising!